For the 107th episode, we take a step in a new direction and open up a new recurring series for the show, in which we take a look at a popular series from film history. Over at the LAMB Forums, the participants in the show voted from a number of franchises and the winner was the Alien series. On hand for the show was host Dylan as well as Nick, Tom, Fogs and newcomer Mark of Green People Soup. * Due to the bandwidth issues I’ve had with Podomatic recently, I’ve gotten rid of the embeddable player that is usually included with these posts. The show can be found, of course, via iTunes – just do a search for “LAMBcast.” Also, I always post a link to the show on the LAMBcast’s Facebook page, and there’s a player there if you’d like to listen online. Amazing turn out of Alien Chops!!!! The rest of this comment will be a spoiler fest!!! I think this is one of the best LAMBcast episodes to date. Most retrospects podcasts that plow a franchise in one episode are way to lengthy and drawn out but you can tell that everyone was very versed and well prepared for this one. Some of you might know that I’m quite the Alien 3 fan and I might have wished for some more exploration on that one since I find that Aliens and Alien 3 is the backbone of the larger than life Ripley legacy that is the most interesting sub-plot of the films. With that in mind its crucial that Newt and Hicks are killed off in the beginning. Regarding Alien I think its an awesome film that was ahead of its time in set design, cinematography etc. However, its the film I’ve seen the most and I do think that repeat viewings don’t help it. 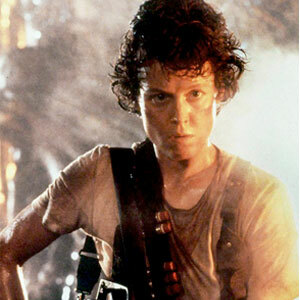 Resurrection would have been a ton better if Ripley hadn’t been in it. It has some bright moments and is fairly entertaining but I do think it would have been more entertaining as a film in its own universe rather than being part of the Alien franchise. My rank of the films would actually be: Aliens (seeing it this time I really felt its a masterpiece, its probably on my all time top 10 list), Alien 3, Alien, Alien Resurrection. Final thoughts on the franchise is that I really like the idea of so different sequels and its a good point how they decided to do Alien 3 like they did instead of going bonkers trying to outdo Aliens. The only demand Sigourney had when going on board with Alien 3 was that it should be a film without weapons so that probably played into how they chose story for it. I didn’t know that about Weaver and her demand for Alien 3 – that’s certainly interesting and definitely played a big role in how the film played out. I like it as it caused them to think a bit outside the box as to how to dispatch of the alien; having unlimited future technology at their disposal makes it a much fairer fight when it really shouldn’t be. I agree with Joel that this was one of the best Lambcast episodes yet. I’m definitely hoping that I’m able to join one of these in the future, particularly if you do Rocky or James Bond. I also would have considered Aliens the best of the franchise for a while, but my thoughts have changed over the years. It’s a great action film, but there are a few stretches that drag, and the Cameron dialogue doesn’t hold up so well. On the other hand, I liked Alien a lot more on repeated viewings, especially when I saw the Director’s Cut in the theater when that was released. It’s a lot more chilling in a darkened theater on the big screen. The Assembly Cut of Alien 3 is a lot better than the original, but it still struggles for the reasons you mention. My biggest issue is the lack of distinctive supporting characters beyond Dutton and Dance’s roles. There are some visually stunning moments, but it never comes together on the whole. Finally, Resurrection actually seems a lot worse on a repeat viewing. I love a lot of the character actors, especially Ron Perlman and Michael Wincott. It has an interesting style fitting with some other movies by the director like The City of Lost Children, but it seems really hokey and doesn’t work once you get past a few really strong sequences. Nice to see such glowing feedback!